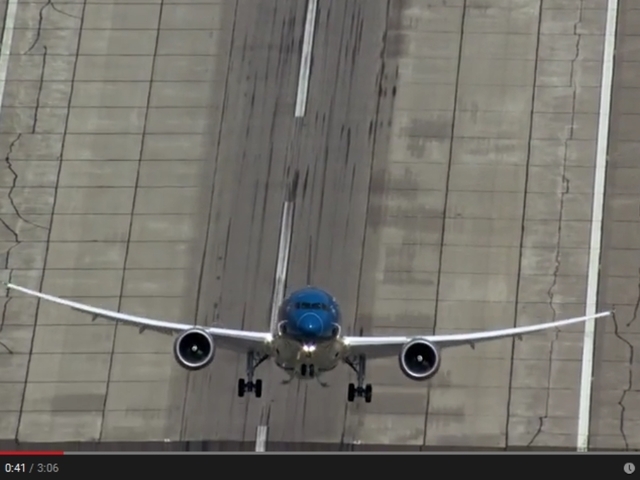 This Is Your Captain Speaking: Boeing 787 Takeoff? Meh. Hey, don't get me wrong, the 787 is one beautiful machine and I'm sure the takeoff was very very impressive, but it's really nothing too special. Pretty much any airliner flying today could make a similar display. One reason that this takeoff video looked impressive is that it was shot from a helicopter with a telephoto lens. The lens makes everything in the distance appear to be foreshortened, which means that the vertical aspect in the shot is emphasized by the magnification of the lens. The other reason is that the airplane is doing something that is normally never done. It's what pilots call a maximum performance takeoff. And other than places like Orange County, California, it's never seen. Even the takeoffs from Orange County will be less dramatic because those planes have people, luggage and fuel aboard and the pilots are still limited to 20° climb angle. The 787 demo had no passengers, no luggage, and very little fuel. And it was flown by Boeing test pilots. 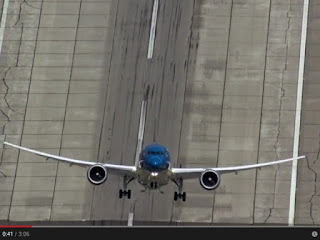 Judging by how many shares of this video are showing up on Twitter and Facebook, people must be thinking that the 787 is one badass airplane: the airline equivalent of a '69 GTO with the 428 under the hood. That would be a misperception. The 787, like all airliners, was designed to make money. The engines that Boeing hangs under their airplanes' wings are only big enough to be able to do two things. One is to be able to lift a full plane, carrying enough fuel to cross an ocean off the ground in less than about a mile of takeoff roll. The other is to keep the beast airborne for a few hours with only one engine working should the other one quit. Any thrust in excess of the amount needed for the above jobs would mean excess weight, and be a waste of fuel and of course money. Remember, this thing has to make money. In fact the whole reason for the existence of this video is to stir up interest for a huge sales event, the Paris Airshow. One of the largest aerospace trade shows in the world, the Paris Airshow is where corporate poobahs meet to show off their wares and to sign sales orders for billions of dollars on everything aviation related. Who would like to guess how many cases of Dom will be on hand? And for anyone who has any experience with trade shows or sales and marketing, you know that the decision making depends on way more than mere green eyeshade concerns like acquisition or operating costs. There's also that certain je ne sais quoi which will add just the right amount of pizazz to close the sale. At aviation trade shows, that means airborne displays. Hence the Paris Airshow. Of course the ne plus ultra of airshow extravaganzas was way back in 1955 when Tex Johnston rolled the prototype 707 at an airshow in front of the world's aviation executives. When called into the office by CEO Bill Allen and asked what he was doing, Johnston simply replied "selling airplanes". I will bid adieu to this post with a pointer to an equally dramatic takeoff video of a 70s era military DC-10 at an airshow.